Although it ended with clouds overhead (and boy do we need rain) we enjoyed another week of sunny skies to work under. We started the week sheathing the exterior of the first floor with plywood and used a router to open up the windows and doors. 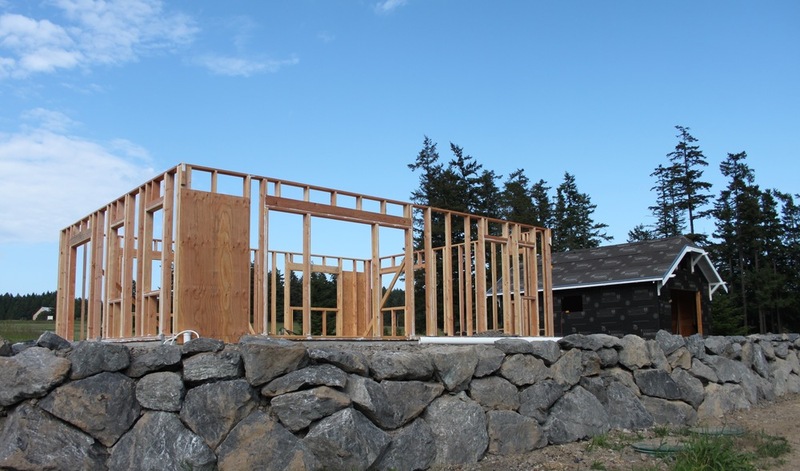 Then we move inside where we began framing and lifting interior walls, starting with our two load bearing walls and tying them into the corresponding wall plates. Next we framed up the non-load bearing walls, a lot of fun as it gave shape to the layout of the first floor - it’s very spacious! We also tried something new with the transition between the mudroom and the living room: we framed out a 2 x 12 dividing wall between the two rooms. On the larger half of the living room side, there will be bookshelves built into this extra deep wall, and on the mudroom side we are going to install site-built drawers to hold hats, gloves, scarves and other “mudroom stuff.” Once trimmed out it will also give the house an extra deep entrance between the spaces. Today, to close out the week, we started installing joists for the second floor and we expect to actually have them finished tomorrow. Finally, the garden we planted last week in traumatized soil has begun to sprout! A new garden is always a joyous occasion and this one's sprouting so fast.